These errors also put you at risk of committing poor academic practice. This is the term used when you produce work which may be fully referenced, but (for instance) relies too heavily on only one or two sources, or is generally too derivative (includes too many words quoted from other people and not enough of your own analysis and exposition), or is inadequately paraphrased (too close to the original). Both plagiarism and poor academic practice leave you liable to penalties which may be determined at a School, Faculty or University level. These can range from a substantial reduction in your marks (or even a mark of zero) which can affect your final degree classification, to a formal misconduct hearing which may result in your being asked to leave the University. Read your feedback carefully – if your referencing has been criticised, find out what you are doing wrong and put it right before your next submission. A ‘second offence’ may be treated much more seriously, even if it is for another marker. Always use good notemaking and record keeping practices – be thorough and accurate; always make a note of the details of the source before you write any notes; avoid doing ‘cut and paste’ research; read a paragraph then write in your own words what you have understood and how it relates to your assignment brief. Find out when you need to use a citation – acknowledge every idea you get from your research – not just direct quotes. Understand how to use references to support your discussion, not replace it – your work needs to be a balance of your own understanding and analysis, backed up by references to other sources, most of which should be scholarly. Think about the boundaries when you are working with other students, either formally or informally - you may be doing group research, or revising with your friends, but you should always make sure that the writing for your final assignment or exam answer is all your own work. Give yourself enough time for checking - often unintentional plagiarism happens because students finish work at the last minute and hope that everything has been correctly acknowledged, or that their marker won't notice any errors - don't take that chance. Don't plagiarise yourself! 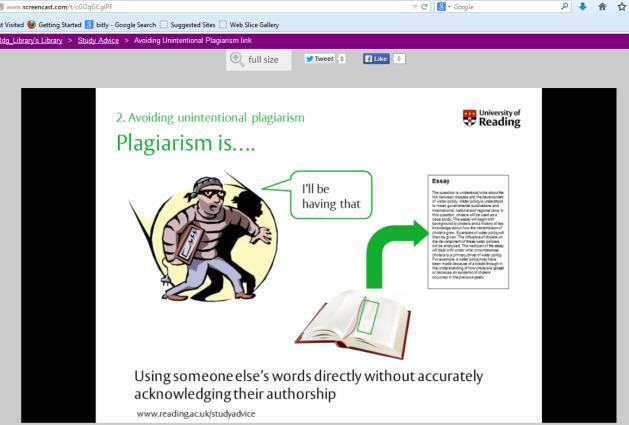 - if you submit a piece of work that includes sections from something you've submitted previously without acknowledging it, it may be counted as plagiarism, even though the ideas are yours.